This is just a preview of the film Dream of Fields, which to our knowledge will never be made, but the trailer still stands. The preview was filmed on location in Dyersville Iowa in the sweltering heat of the summer of 2005. 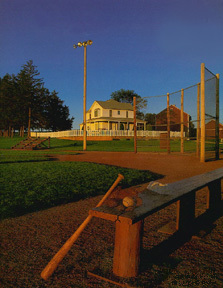 Production began shortly after arrival at the Field of Dreams movie site you see in the preview. Production rapped about an hour later with the last scene being the drive off at the end of the preview. We would like to thank the Field of Dreams site owners for allowing us to film this and for the great shirt. Dream of Fields stars Kevin Costly, Amy Ismadigan, James Hessian Jones, Scaryliotta and many more stus who involuntarily showed up on the day we filmed. The temp outside was a constant 95 degrees Fahrenheit. This preview is copyrighted 2005 Wilkins Peak Studios and Ubstudios. Download the preview (about 3 MB .wmv format). You will need Windows Media player for this to work. If the picture above doesn't work, try the link below.